"IT’S AS IF THE PUNCH BROTHERS, SAM BUSH, JERRY DOUGLAS AND THE CHIEFTAINS ALL GOT TOGETHER FOR A BATTLE OF THE BANDS BUT DECIDED TO POOL THEIR RESOURCES INSTEAD. THE FUTURE OF WORLD MUSIC HAS ARRIVED." "These four lads just keep taking their musical genius to new levels. 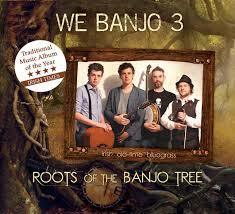 Live in Galway is banjo driven rocket fuel and the spark of We Banjo 3 has ignited a musical furnace that is set to burn for a long, long time"